Today the Los Angeles City Council will consider a new city ordinance that would require all buildings--yes, residential homes, too--to be anti-graffiti coated from the ground to at least nine feet. However, owners may choose to skip the requirement as long as they sign an agreement that any graffiti on their building will be removed within seven days, according to the Daily News. That's a good exception because the coating can discolor a surface or are not always environmentally friendly. And not to mention the burden of time and money on families. Meanwhile, the city of Santa Clarita is set to unveil a Paint Matching Trailer to be used by the Graffiti Task Force. 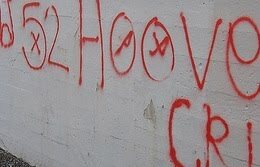 "The City’s Graffiti Ordinance states that property owners must remove graffiti on businesses and residences within seven days from the date when properties are tagged," according to a city advisory. "The City’s new Paint Matching Trailer will enable the Graffiti Task Force to provide paint matching services to local property owners, which will expedite the required removal of graffiti on private property." meanwhile, the advertising for the movie 2012 uses its orange graffiti tagged ads without issue.